Lotus corniculatus growing herbaceous‎ legume of the genus Lotus also known as Birdsfoot trefoil, Lotus corniculatus perennial evergreen or deciduous plant used as ornamental ground cover fixing nitrogen attract pollinator fragrant plant, can grow in mediterranean, desert, subtropics, temperate climate and growing in hardiness zone 3-10a. Leaves color green in lobed shape 3 lobes. Flower fragrant color yellow or orange some cultivar yellow with orange in pea shape. 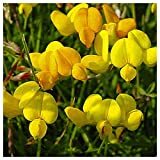 Lotus corniculatus BIRDS FOOT TREFOIL Seeds! Lotus corniculatus BIRDSFOOT TREFOIL Seeds!